Andersons Angels: New Year's Resolutions Have Gone to the Dogs, Literally. New Year's Resolutions Have Gone to the Dogs, Literally. With 2016 finally here, I've already been planning about how to make this new year the healthiest one yet. Although there are numerous ways I could improve myself (couldn't we all) and my health, what if I could also get my family involved including my furry family members, too? Milk-Bone (the makers of my pup's favorite dog treats) recently conducted an original survey of 3,000 pet parents nationwide to find out which healthy habits families are pledging in the new year. ~ According to the survey, 44% of pet parents say that having a dog brings a family closer together. Whether it's taking Fido to a new dog park or adding a few minutes to your daily walk, you can easily increase quality time with your pup. ~ In addition to plenty of play and exercise, consider providing your pup a daily vitamin supplement, such as Milk-Bone Good Morning Daily Vitamins, which promote well-being, longevity and overall good health. ~ Taking your pup on vacation not only adds fun, but it also alleviates the worry of not knowing what's happening wth him while you're away. Be sure to bring his favorite toy or something he loves to keep him calm during travel. ~ Weary about brushing your canine's canines? Start a new daily routine and try a dental chew, such as Milk-Bone Brushing Chews -- which clean teeth, remove tartar and fight dreaded doggy breath. 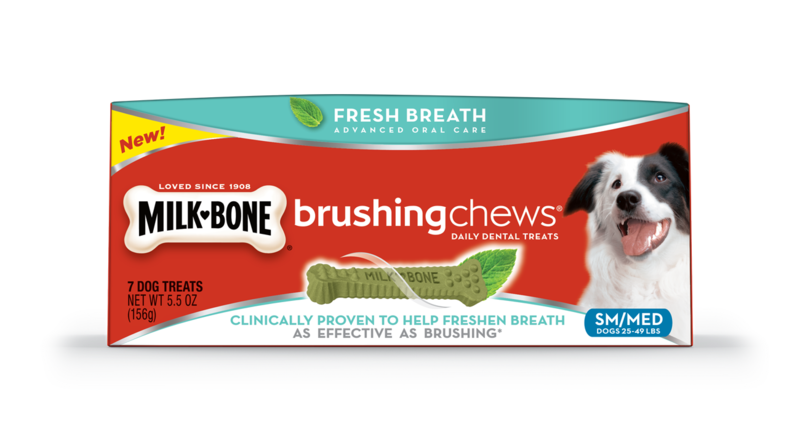 This daily dental treat also comes in a new 'Fresh Breath' flavor (in stores Feb. 2016) for an even tastier clean. ~ Vitamins provide beneficial nutrients not found in regular dog food -- which is why it's a good idea for both of you to start the day off right with a daily vitamin supplement. Milk-Bone Good Morning Daily Vitamins support your dog's immune system, brain, heart, and digestion. ~ If you have a timid dog, the key to reducing his stress is by building his self confidence. Start by teaching him to respond to basic commands -- it will make him feel more comfortable in his environment. ~ Every dog loves (and often begs for) tasty table scraps. Next year, resist the urge and provide tasty pet treats instead. These Milk-Bone treats are ones that not only taste good but are (actually) good for them. ~ If you can't leave work early, consider providing a new furry companion for your pup. Or perhaps you can arrange for a friend's dog to make a house call. ~ Just like us, some pups could stand to lose a few pounds. Next year, make Fido your accountability partner and commit both yourselves to eating healthier, along with plenty of play and exercise. ~ Experts are experts for a reason. Accredited dog trainers have tons of experience in teaching both pets (and pet parents) positive reinforcement techniques that are safe and effective. I am curious what resolution are you planning to make for you and your dog in 2016?